Whilst the focus of my Star Wars action figure collection is that of Vintage era figures (1977–1989) made by the mighty Kenner, I couldn't resist buying this Neo-classic era (1990–2000) figure when I found him lurking in the bottom of a bargain bin just yesterday! My curiosity was piqued because whilst this is one of the recognisable aliens glimpsed during the classic cantina scene in the original Star Wars movie - when Luke Skywalker and Obi-Wan Kenobi are looking for a pilot, and meet Han Solo - he was never honoured with an action figure the first time around. 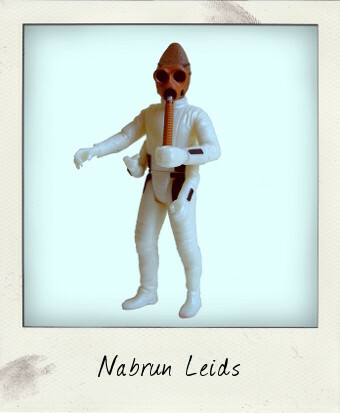 Nabrun Leids - Star Wars meets Steampunk! Hasbro put that right in 1999 with the release of a 3-pack entitled “Cantina Aliens” as part of the Power Of The Force 2 Collection featuring our Nabrun Leids here, alongside two other figures Takeel and Labria. Hugely reminiscent of the 3 ¾ inch figures in the vintage Kenner line in its molding and paintwork, this figure wins extra points for having eight points of articulation (at the neck, waist, hips, and shoulders) although being a four-armed alien does rather put him at an advantage in the articulation stakes! The detailing on his gas mask face, scaly dome-like skull, and protective clothing, is excellent - I love how Steampunk this guy looks! 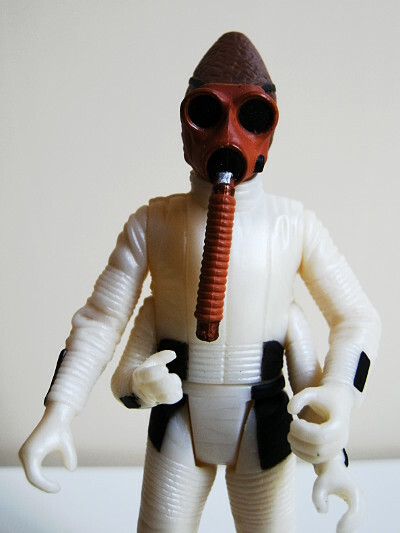 His mask isn't removable, but his breathing tube for inhaling methane is slightly bendable. He's certainly a very good movie-likeness of the pilot smuggler. Kenner was bought-out by Tonka in 1987, and again by Hasbro in 1991, but until 1999 POTF2 figures were still marked with the Kenner name. This figure is marked “KENNER” with the COO “CHINA” on the sole of his left foot, with © 1999 on his right. The three pack also included a blaster rifle accessory for Nabrun Leids, which my loose figure has inevitably lost, but he's nevertheless a fun find, and excellent for adding extra aliens to any Star Wars diorama!